The image of the Wicked Witch flying on her broom is much older than The Wizard of Oz. European folklore is filled with images of witches flying through the night sky on their brooms. This archetypal image is actually somewhat grounded in fact, though the reality is slightly different than the stories, which have been handed down. “Flying” is a metaphor for astral travel. Witches would use a flying ointment or some other trigger to help them “fly” out of their bodies and travel on the astral plane. One of the other often referenced triggers is a “juice” made from basil leaves. Witches would drink this basil tea to induce the ecstatic state necessary for astral travel. If you would like to attempt astral projection, make a decoction of basil leaves. Be sure to drink liberally of your brew. However, the benefits of basil do not stop there. As a Martial herb, it can be used to protect your property or person. When you are in need of courage, basil can come to your aid. It will soothe your temper when you get hot. It can even be used to attract the passionate feelings of others. All-in-all, basil is, bar none, the best Martial herb for beginners to develop a relationship with. It has so many uses that they couldn’t possibly all be listed in this short article. Magickally, the scent of basil (used as part of an incense) will cause sympathy between two people. You can rub the fresh leaves on your skin to create a love potion of sorts. Basil can also be used in divination to tell you if your partner is faithful or promiscuous. According to Scott Cunningham, if the sprig of basil withers when you put it in your partner’s hand, they are promiscuous. If it remains fresh, your partner is faithful. Basil can also be used to help you ensure that your partner remains faithful to you. On a medicinal level, basil oil seems to promote quick healing. It is excellent for healing minor scratches and wounds. Make a poultice of basil and wrap it around the wounded area. Taken internally, basil will soothe the nerves and ease the aches and pains associated with inflammation. It is also said that basil can cure a headache. While its magickal and medicinal uses are impressive, the real potential of this plant blooms in the kitchen. 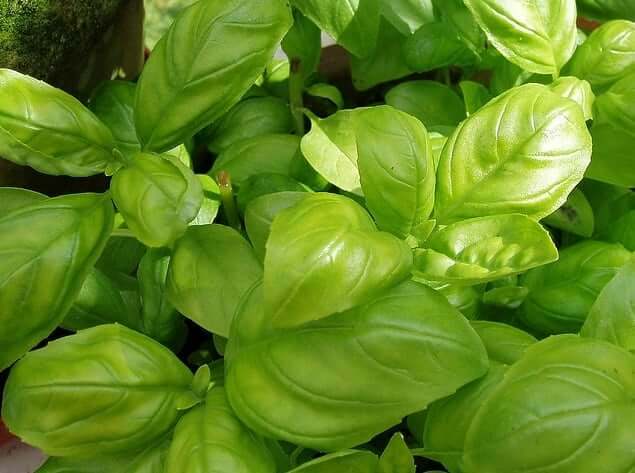 If you are Italian (or you have ever visited someone’s Italian grandmother for dinner), you know that basil can be added to almost any meal to enhance its flavors and provide the finishing touches that really make a dish unforgettable. No pasta sauce is complete without it. However, it is not just Italian cooking that benefits from this herb. Asian and Thai cuisine also employ basil quite liberally. It can even be added to ice cream to provide a cool and spicy after-dinner treat. Once you really get to know this herb, you will find that it is one of the most versatile herbs in your garden.